This year’s edition of the spooky television show deals with a married couple that move to Roanoke Island, the scene of the famous “Lost Colony’ that was found abandoned in 1590, with no trace of where the English settlers had gone. On this spooky, allegedly haunted ground, the new dwelling of is the base of a lot of evil, paranormal goings on told to the audience in a documentary style, featuring 2 sets of actors, the first set being the “real” couple, and the other being actors portraying the “real” couple. 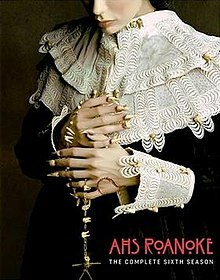 The docu-drama approach is new to American Horror Story, but many previous actors are again found in this season’s cast, including Angela Basset, Kathy Bates, Lady Gaga, Sarah Paulson, Lily Rabe, Denis O’Hare, Wes Bentley, Cheyenne Jackson, Evan Peters and Adina Porter. Cuba Gooding, Jr. and Andre Holland round out the main characters. American Horror Story airs on FX on Wednesdays at 10 pm. Questions for students: Are you watching the current season of American Horror Story? Have you watched the past seasons? If so, which season is your favorite and why? The picture is irreplaceable, since the people were sentenced to super long prison terms and no editor can go to prison and take their picture and then upload here. The resolution is not high. The image, as mugshots, is used to illustrate the criminals for educational purposes. Previous ArticleHistory: September 27, 1956: Test Pilot- Exciting, Dangerous, Deadly! Next Article History: September 29, 1975: What’s Up With The English Language? November 1, 1968: How Do Movies Get Their Ratings?